A 16-year old Hermiston girl died in a multi-vehicle crash near Tumwater Saturday afternoon. Washington State Patrol reports that the accident happened at 1:46 pm Saturday on Interstate-5. 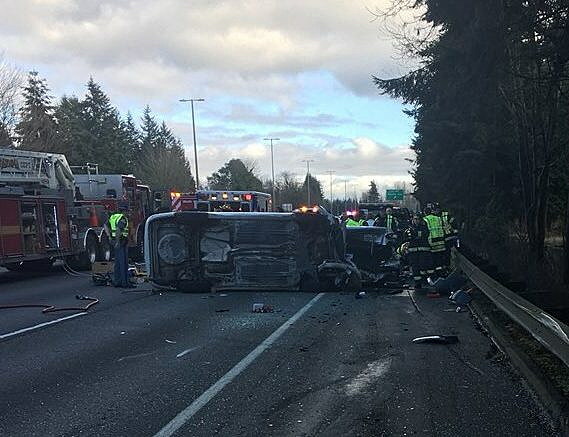 According to a press release, a car driven by David W. Willis, 40, Poulsbo, drove onto the shoulder of the interstate to get around slow traffic. As he moved to the shoulder, his Ford Focus hit a Nissan Sedan that was on the right shoulder helping another vehicle with a flat tire. The collision sent the Focus onto its side in the lanes of traffic, and pushed the Nissan into the lanes of travel as well. The driver of the Nissan, David Navejar, 48, Hermiston, was not hurt. A 16-year old girl who was a back seat passenger in Navehar’s car, died at the scene. Her name has not been released. A 42-year old woman in the Nissan was also taken to the hospital with injuries. Trooper John Batiste says Willis suffered serious injuries, and an 8-year old girl in the car with him had minor injuries. Willis is expected to be charged with vehicular homicide and possible impaired driving.